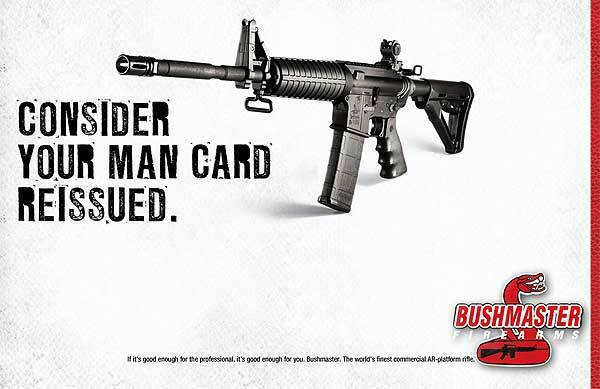 Windham, ME –-(AmmoLand.com)- Inspired by the overwhelming response to Bushmaster’s “Consider Your Man Card Reissued” sweepstakes, today Bushmaster Firearms announces the latest part in the series; the Man Card online promotion. To become a card-carrying man, visitors of Bushmaster.com will have to prove they’re a man by answering a series of manhood questions. Upon successful completion, they will be issued a temporary Man Card to proudly display to friends and family. The Man Card is valid for one year. Visitors can also call into question or even revoke the Man Card of friends they feel have betrayed their manhood. The man in question will then have to defend himself, and their Man Card, by answering a series of questions geared towards proving indeed, they are worthy of retaining their card. Bushmaster invites you to visit www.bushmaster.com/mancard to earn your Man Card and have some fun. If you decide to revoke the Man Card of a friend or two along the way, that is entirely up to you. Check out more Bushmaster Gear. Click for Man Card Unless Your Scared? What a sick pack of bastards you yanks are. No wonder the world hates you, as Randy Newman says. Oi you got a loicence for that social media post? To Bad its not the worlds only Authentic Man Card, Issued by us: OfficialManCard.com.